The wood is acclimated and the veneer press screws were delivered a while ago, so I think it may be time to finally make that bench top joinery bench. I’ve always liked the plans and I think there is some room left in a corner of the shop where it can live when not on the bench. I wonder, though: is it worth including any storage underneath? 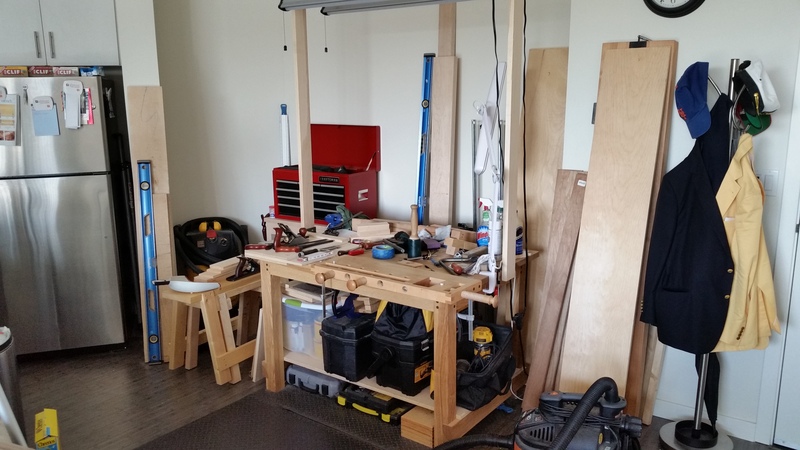 I think I’d add a drawer (or maybe just a sliding tray) to hold my dovetail saws and coping saw (and spare blades). Not sure it’s practical to store anything else in a mobile joinery bench. Either way, my “clamp-on worksurface” collection might be getting out of hand. In my experience no matter how much space there is, I’ll eventually clutter it up. I’ve learned to make peace with it. I love that the plans from F&W show a dude using a router at approx chest height as a good use for that joinery bench (without earplugs, too! ); but then again, who am I to judge? I know, right? Not sure I agree with the placement directly over the vise, either.